Audio amplifier circuit using integrated TDA2030 and op amp Ne5532, has two stereo amplifier left and right satellite and Bass amplifier using TDA2030 in bridge for more power. The filter is made by double operational amplifier Ne5532. Complete assembly with the suggestion of the printed circuit board and has a power supply coupled to the circuit. This circuit is a remake of another already posted on the Blog, but with some changes, uses two TDA ic’s in bridge to the subwoofer amp, with a new board design with some improvements. The idea is that to achieve maximum 18Watts satellites and the outputs 32 watts in Subwoofer … This power with a maximum of + -18 Volts Speakers and 4Ω. The circuit has adjustable volume for the stereo and subwoofer. Use pots of good quality to make this work. By making the assembly check all connections and all components are correctly positioned, and the orientation of the pcb, be mounted inverted not seen it work, the components have to be positioned as illustrated above. When mounting make sure that the pin 7812 is different from 7912. Use a good heat sink to the TDA IC’s. The power supply is already fixed in the PCB and only add the transformer, to be with center tap on the secondary and primary according to the network (110/220). The capacitors can be supply of the 4.700μF at 10.000μF, the resistors are in parallel to discharge these capacitors Great. Always use good quality components in its assembly. The appropriate transformer to the circuit, according to my withdrawal must be at least 3 A transformer or to the 60VA 12-0-12 Volts. B1 KBU8B – Bridge Rectifier – 100V 8A or equivalent. IC3 7812T – Positive Voltage Regulator +12 V Any prefix (LM, NS, KA, etc.). IC1 7912T – Negative Voltage Regulator -12V. Any prefix (LM, NS, KA, etc.). Soldering, transformer 12 +12 / 4 Amps (50 Va), Wire, Box for Amplifier, PCB, heat sink for the IC TDA, etc..
Download files for this assembly – PDF PCB, Schematic,PDF, silk screen, TDA2030A and NE5532 Datasheet . On pcb lay out SubWoofer connection didn’t have ground connection please let me know if I am wrong ? This is a bridged configuration. I think subwoofer ground connection is not right. i`m in the middle of this project, i found many differences between pcb labeled components and parts list you gave on site, plz tell me should i follow components of pcb Diagram or Components list on website ? is your website updated now ? i am going to build with your design..
2. Circuit diagram image navigate to Page Not Found. Sorry, thats ok now. Problem 2 not solved. Pdf download hoti hai lakin open nahi hoti ……. PPPPllllzzz Tell me the size of this PCB PLLZZ ??? hey toni if I change the value of 104 capacitor 50 to 100 volt…. so does it gonna work????????? Can I use UTC 4558 instead of NE5532 in this amplifier circuit??? what is the height and width of this pcb?i was going to order that circuit to be printed then they asked me about the dimensions.can you help me please? btw very nice work. On the 2.1 Amplifier with Subwoofer using a TDA2030 & NE5532. Can the TDA2030 be replaced by TDA2050 using the same circuit for a little more output. I hope you can help. I assemble the pcb. after i have two problem in there. first one is bass is not clear another one is one Chanel sound is very minimum. Plz toni help me soon as possible. Plz tony helm me plz…. Bridge tda 2030 not out of sound, because not have resistor and electrolyte. please look at schematic bridge tda 2030, you can see differences them. Correct me If I wrong, Huge for you! 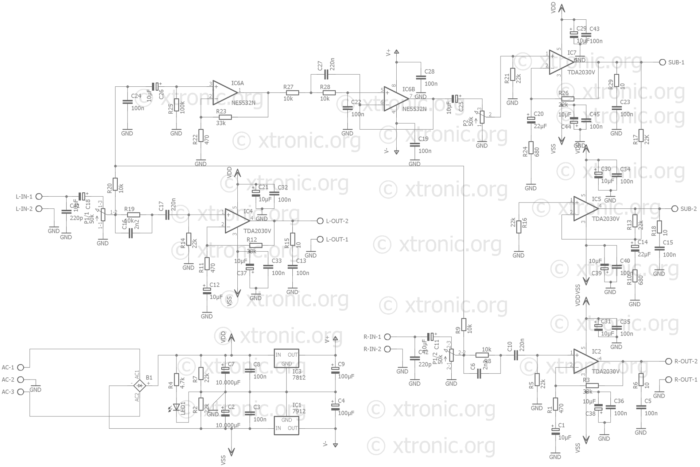 Oh yeah, please look at schematic TDA 2030 in Bridge Mode, U can see at PIN number 2, That pin is differences. please add resistor 47ohm And resistor 470. thank you. I had assemble your sugested diagram but when i am connecting the woofer 4ohms 25w the transformer is geting over heated in 30min. What shall I do please help me. What is the voltage and power of the transformer? Hi tony plzz help me. What is the dimension of the PCB layout?????? Inject the direct audio signal into c25 and verify that the channel is working. Hi! Tony, I am going to assemble your circuit but you please guide me that how should I add a pot for terrable in this circuit. You had given power trans. of 3A it will be suitable for it the ic2030 will not get heated or I will put 1A. You please suggest me please. A 12+12V 3A transformer is ok! or is it electrolytic capacitor? Pode utilizar TDA2050, sem problemas. do you have layout Bro?. I have a transformer with dual secondary 16V. After the rectifying I will bi +22v,-22V. The maximum supply voltage for the TDA2030 is +-18V. Will this transformer blow the ICs? Hi Xtronic, please help me to get this items, where can i buy this project as DIY i myself will assemble it..
i am very much interested in this circuit..where can i order this..please help me..
What is the filter frequecy of the NE5532? i did not find 100n/100v polyesters capacitor i used disk capacitir???????????????????????? if possible send it to my mail ID. The file does not available in 4share.com. If possible pl mail it to me. Hi Toni. what is the value of capacitor C2 and C7? is it 4700 or 10000 mf mf? I did not find 10000 mf capacitor? And can i use KBU8B 10A instead of 8? And Also can i got TDA2030A ICs instead of tda2030V .. Should it work? 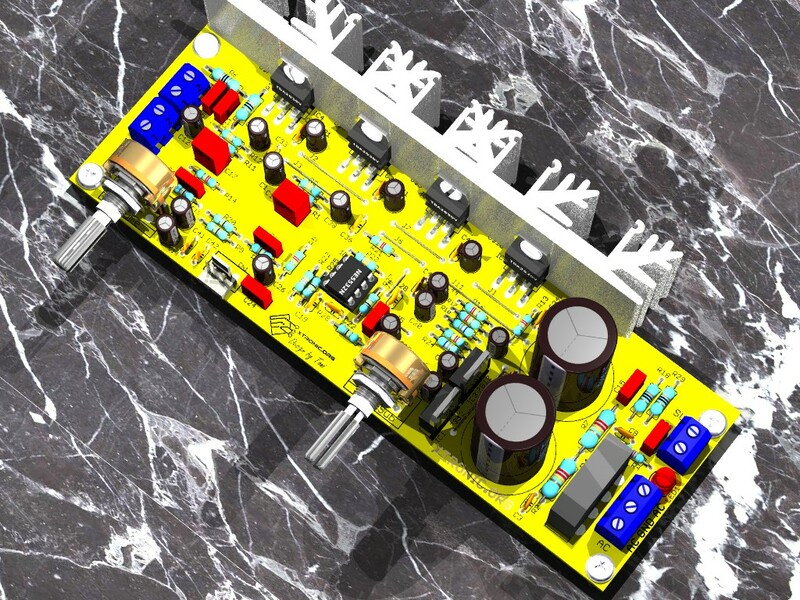 WHAT’S THE CAPACITY(watt,ohm) OF THIS AMPLIFIER….??? please tell me detail about the transformer used in this circuit…! thank u for showing this circuit and parts name….i have tried many of other circuits….but there is no clear description of parts and there no no power supply circuit diagram for that project. can the polyesters be replaced by electrolytic as i cant find suitable polyesters? What is the lowest transformer, amp, that i can use? So i takeoff the SUB- IC and make it to 3x18W (Subwoffer 18Watt same sattlelite) It Ok!!. hi the sch of the bridged tda2030 is different from datasheet sch.is it ok to do this project.if any one had tested then plz say how it works.thankyou. the connections of ne5532n are ok that is v+ and v-…but for the IC’s tda2030v the pins are labelled as vdd and vss…..could u tell me where to hook up those vss and vdd….i mean is vdd–>v+ and vss–>v-….or does the ground wire come in the picture….thanks in advance!